Soybean cyst nematode (SCN) is a severe problem in Indiana, partly because of the state’s intensive soybean culture. This nematode is capable of making marked yield losses (up to 50%) and has been reported in at least 89 Indiana counties (Figure 1). 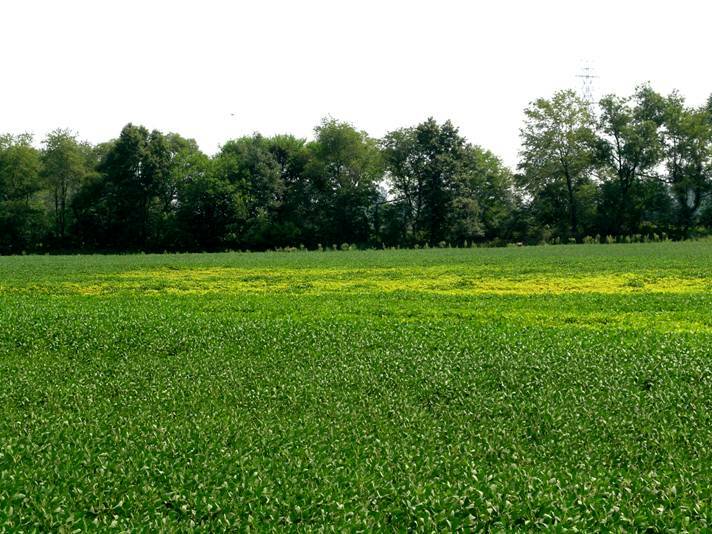 We estimate that about 45% of fields in Indiana might be infested with SCN. Figure 1. Shown in red are counties with confirmed infestation of soybean cyst nematode in Indiana. Symptoms of SCN injury can easily be confused with other problems such as nutrient deficiencies, herbicide injury, disease, poor drainage, etc. The presence of oblong areas of stunted, yellowed plants is suggestive of SCN damage (Figure 2). Symptoms are generally more pronounced when soybean plants are under stress from such conditions as drought, low fertility, or compaction. 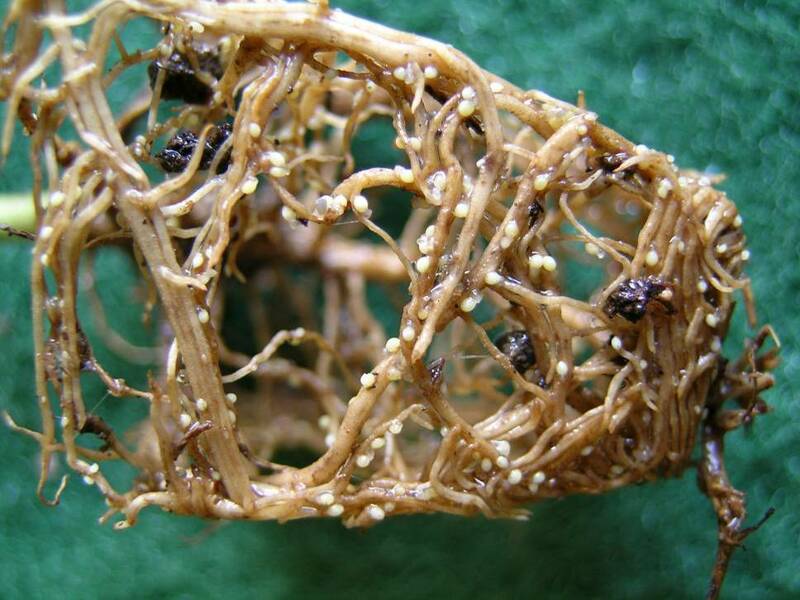 Infected plants have poorly developed roots and very few Rhizobium nodules. Early in the growing season (6 weeks after planting), close examination of the roots may also reveal small, white to yellow spheres (bodies of female nematodes) attached to the root surface (Figure 3). These females are not much bigger than grains of coarse sugar, and should not be confused with the much larger Rhizobium nodules. Figure 2. Above ground symptoms of SCN damage to soybean. Figure 3. White SCN females on soybean roots. p>This nematode, like all nematode species, is an unsegmented roundworm. Stages in the life cycle include egg, juveniles (larvae), and adult. The infective stage of the nematode is a microscopic worm-like second stage juvenile which hatches from an egg and moves a short distance through the soil until it encounters a soybean root. The juvenile enters the root, begins to feed, and eventually grows (by a series of molts) into a lemon-shaped adult female which may contain 200-500 eggs (Figure 4). At this stage the nematode is loosely attached to the root by the head and neck, with the visible swollen portion of the body protruding from the root surface. 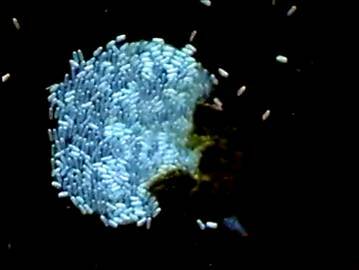 When the female dies, the cuticle turns brown and becomes a tough, protective package for these eggs. This stage, called a cyst, is very resistant to decay and can remain in the soil for many years with viable eggs ready to hatch. Figure 4. White SCN females on soybean roots. The life cycle of SCN, from egg to egg, takes 21-28 days under optimum conditions (soil temperature 82 or 75°F); thus several generations are possible during each growing season in Indiana. Early on variability among SCN populations were recognized. This variability has been characterized as races (and later as HG types). In the scientific literature, sixteen possible races of SCN have been proposed. Races are defined by the ability of SCN population to reproduce on four standard soybean differentials. SCN races are characterized by the amount of reproduction an SCN field population has on each differential as compared to the development on a universal susceptible. The number of females on a test differential is divided by the number of females on the susceptible and multiplied by 100, which gives the index of parasitism (IP). Then resistance (-) or susceptibility (+) is based on the “10% rule” which states that a differential with IP less than 10% is to be considered resistant (-) whereas a differential with IP of 10% or more is considered to be susceptible (+). Thus two field-isolates, both of which have a (-) reaction (less than 10%) on one of the differentials, would have the same race designation even if one had only 2% development and the other had 9.5% development on this differential. Or, if both isolates had more than 10% development on one of the differentials, one might have 11% whereas the other could be 65%, yet they would still be considered as belonging to the same race. Recently an updated version of race test, called HG type has been introduced. The 10% rule is still in place but list of differentials has been modified to better reflect today’s source of resistance cultivars. More detailed information on HG type can be found in the following website <http://www.soybeanresearchinfo.com/diseases/scnhgtest.html>. Race 3 (HG type 0) used to be common in Indiana. But the extensive use of resistant cultivars with the same source of resistance (PI88788) has caused a “shift” in SCN populations in Indiana. We now encounter many SCN populations that can overcome the common source of SCN resistance (PI88788). While cultivars with PI88788 source of resistance are still useful, more suitable cultivars with other sources of resistance, like Peking and PI437654 (CystX®, Hartwig) need to be introduced for better management of SCN. If there is a pattern of poor soybean growth, or an unexplainable low yield, or if SCN is known to be present in nearby fields, soil samples should be collected from a depth of 6-8 inches and sent to a nematology laboratory for analysis. Place the sample, consisting of at least a pint of soil, in a plastic bag and close with a rubber band or string-tie. Attach to the outside of each bag a label identifying the sample. If you do not have a specific problem area, collect small amounts of soil (with a probe or trowel) from the entire field. The larger the number of subsamples, the greater the chance of recovering one or more cysts if SCN is present. Mix this soil thoroughly, and then take a subsample of 1 pint. Please check out this listing for private and public nematology laboratory sampling. While SCN can move through the soil only a few inches a year on its own, rapid spread can occur by the movement of infested soil. Cysts in soil adhering to equipment, soil peds in seed lots, or soil moved by wind and water can spread SCN to previously noninfested fields. Since size of population (numbers of eggs per 100 cc volume of soil) can influence control strategies, no one method for control of SCN is recommended for all situations. In most cases, a combination of practices is needed. Rotating soybeans with a non-host crop is the simplest, least expensive method to reduce SCN populations. Wheat, followed by double crop beans, is not considered rotation to a non-host crop. Non-host crops include corn, small grains, sorghum, and alfalfa (Table 1). Host plants, on which the SCN population can maintain itself, include all kinds of beans, lespedeza and hairy vetch (Table 1). SCN is capable of reproducing on several weeds including: purple deadnettle and henbit (Table 1). One year in a weed-free non-host crop can reduce an SCN population as much as 55 percent. However, since some of the eggs may remain unhatched in the cyst for years, it is virtually impossible to starve all the nematodes. Depending upon the initial population level, it may take three or more years to lower the number of eggs to sub-economic levels (Table 2). Table 1. Selected Host and Non-Host Crop Plants and Weeds Tested Against Isolates of Soybean Cyst Nematode in Indiana. aArrange according to degree of susceptibility, with the most susceptible listed first. Table 2. Recomended Crop Rotation Sequences for Management of Soybean Cyst Nematode. a Low level of infestation = less than 200 eggs or 1 full cysts per 100 cc of soil; medium level = 200-2000 eggs or 1-10 full cysts per 100 cc of soil; high level = more than 2000 eggs or 10 full cysts per 100 cc of soil. bRefer to Table 1 non-host list. Even though the source of resistance for almost 96% of the current resistant cultivars is the same (PI88788), these cultivars don’t necessarily react the same way toward an SCN population. Soybean cultivars with Peking or PI437654 (CystX®, Hartwig) source of resistance should be used if your SCN population can overcome the PI88788 resistance (Table 2). We recommend growers do a race or an HG type test of their SCN population every 10 years or if they have never done so in the past. Application of nematicides, pesticides which are toxic to nematodes, used to be another method for protecting soybeans from damage by SCN. These products control SCN by reducing invasion of soybean roots by juveniles of the nematode and preventing their feeding and development early in the season. Many of effective nematicides are no longer available but recent introduction of seed treatment products could provide additional options for SCN management. However, these products have not yet proven to be able to manage SCN consistently. More tests and products are needed in this area.